Evening hike dedicated to the marsican brown bear, the symbol species of Abruzzo National Park. We will take advantage of twilight and digiscoping techniques to optimize the chance to see bears. Packed dinner and return to the valley with the aid of torches and moon. 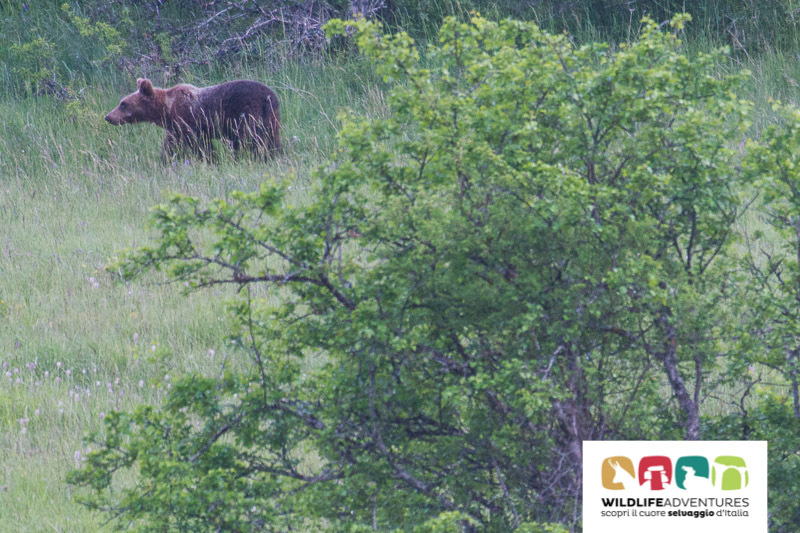 Our aim is to observe bears of course, but also provide to our clients information about bear ecology, food resources, threats and conservancy status, getting a complete bear experience in the Central Apennines. Arrival in Pescasseroli (L'Aquila) at 03:00 p.m and meeting with our guide in our offices at Largo Molinari (Pescasseroli). There will be a short moving until the begin of the path and then the hike. Along the path we will explain you the characteristics concerning the biology of the bear and we will show you the tracks of this animal. After almost two hours of walk we will arrive at the observation areas. Return in the evening, with a charming starry sky that will guide us. We reccomend you to dress in layers. Hiking shoes, sun hat, water bottle, backpack, long pants, hat and wool gloves, jacket, light raincoat or poncho, sun protection cream, non smelling mosquito repellent. We always recommend wearing a t-shirt to spare in your backpack. Pescasseroli is the most important village of Abruzzo National Park, the oldest Italian protected area; it has guaranteed a life in harmony with nature for almost a century. You can easily reach it by car through three access points. FROM ROME (Highway A24 Rome – L'Aquila): from Rome highway A24 until Pescina exit, proceed on SR83 or on SP17 until Pescasseroli. FROM PESCARA (Highway A25 Roma – Pescara): from Pescara highway A25 until Pescina exit, go on towards SR83 or towards SP17 until Pescasseroli. FROM NAPLES (Highway A1 Naples – Rome): from Naples highway A1 until Caianello exit, enter SS85 towards Venafro and then proceed on SR83 until Pescasseroli.